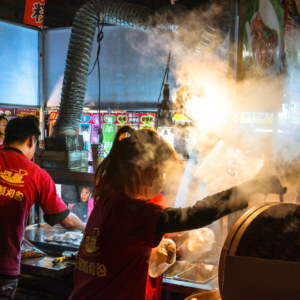 Nishinari is widely reputed to be the most run-down, crime-ridden, and dangerous part of Ōsaka 大阪—and about as close to a slum as you are likely to find anywhere in Japan 日本. This may explain the preponderance of cheap backpacker accommodation in Shinimamiya, the area just south of Shinsekai 新世界 (literally “New World”), where I stayed for a single night last May before returning to Taiwan. 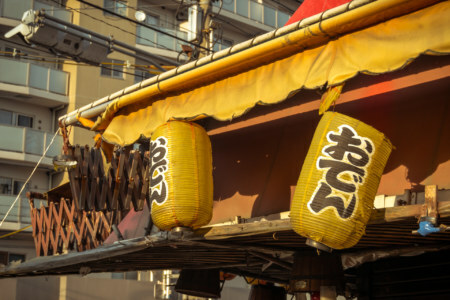 Although I only had a few hours to work with I couldn’t resist wandering around Nishinari to see just how bad it was. I figured it couldn’t be any worse than the Downtown Eastside, the festering carbuncle of Vancouver, which I had wandered through on many occasions. 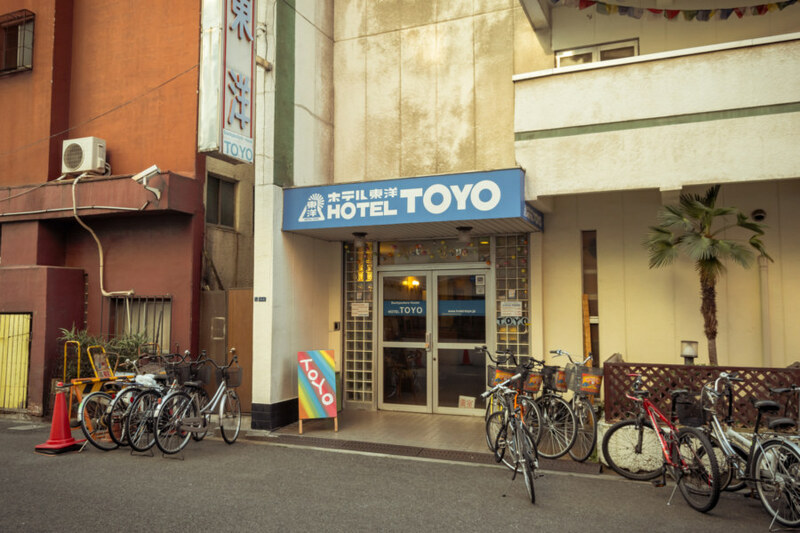 Hotel Toyo, my cheap hotel in Shinimamiya. It’s not a bad place at all. I’d stay there again. 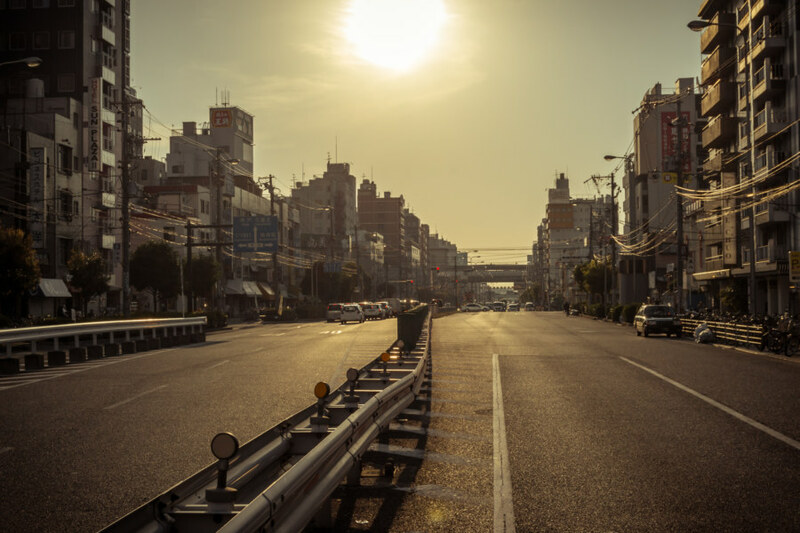 When I arrived at my hotel from Nara it was already late in the afternoon. 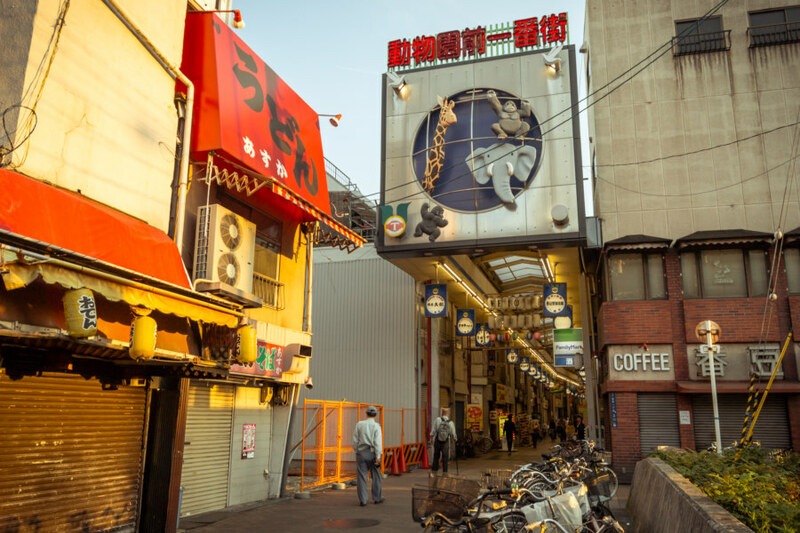 I dropped my stuff off in what amounted to a musty tatami mat jail cell—though for about USD$15 a night I was not complaining—and raced downstairs to hit the streets and capture something of Nishinari’s seedy charm and faded glamour. 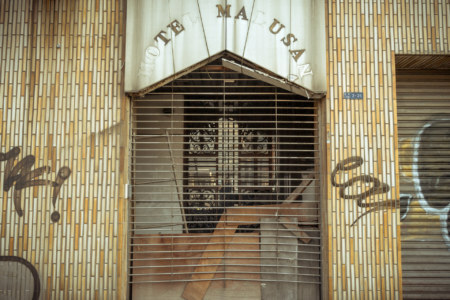 An abandoned hotel in Shinimamiya. I hadn’t previously seen much evidence of decay on this trip to Japan. 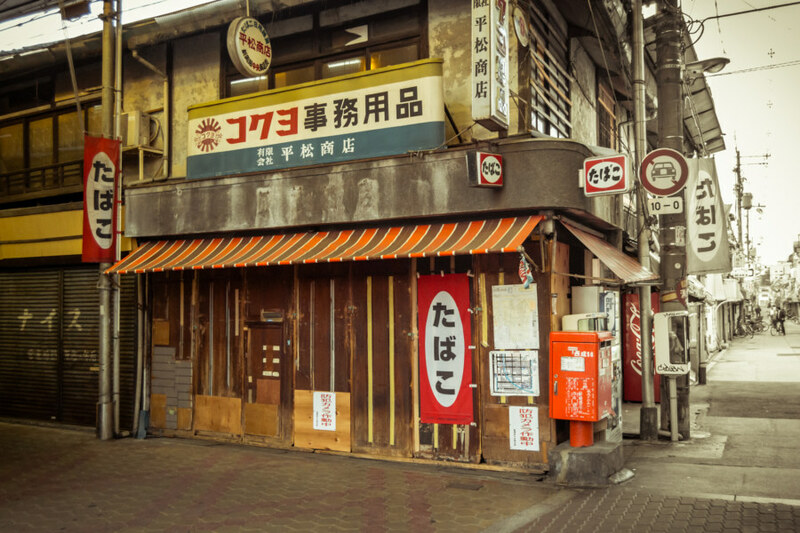 An abandoned storefront in Shinimamiya. Daylight was fading by the time I hit the street to walk around and take some photos. 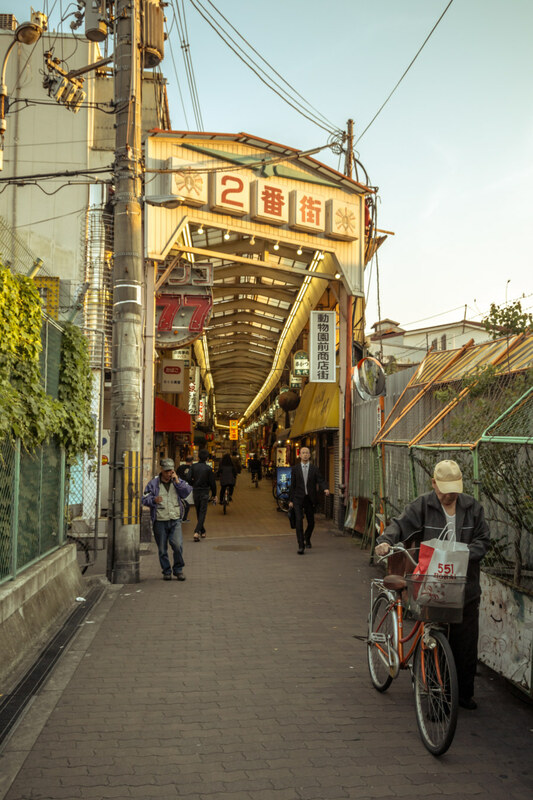 My first stop was Shinsekai proper, the old neighbourhood just north of the railway line loosely modeled on Paris and New York City. It was mostly empty, with just a few stragglers passing through, most of them looking like they were on their way home from work. 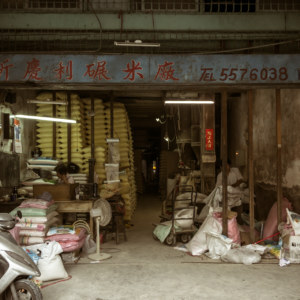 It was not a lively place, nor was there an unusual degree of decay (based on what I’m used to, namely Taiwan), but it was clear that the place had seen better days. The eastern entrance to Shinsekai in Nishinari ward. Crossing under the railway line to Shinsekai. 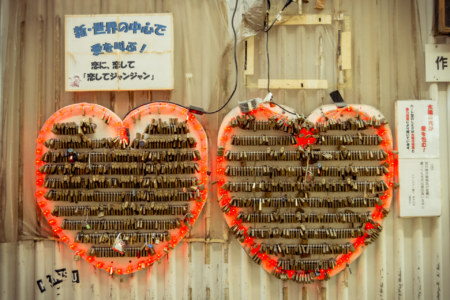 Lock your heart up in Shinsekai. 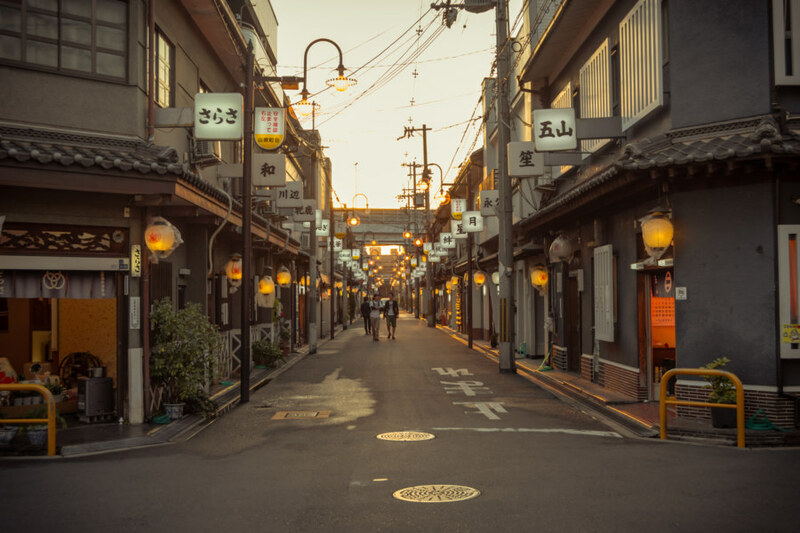 The streets of Shinsekai were mostly empty. 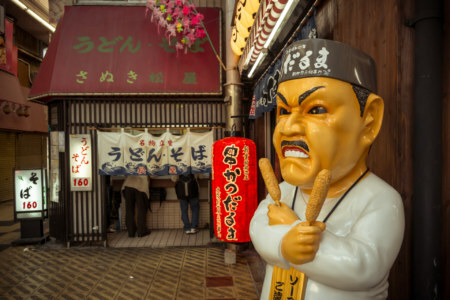 A rather fierce statue outside a closed street food vendor. 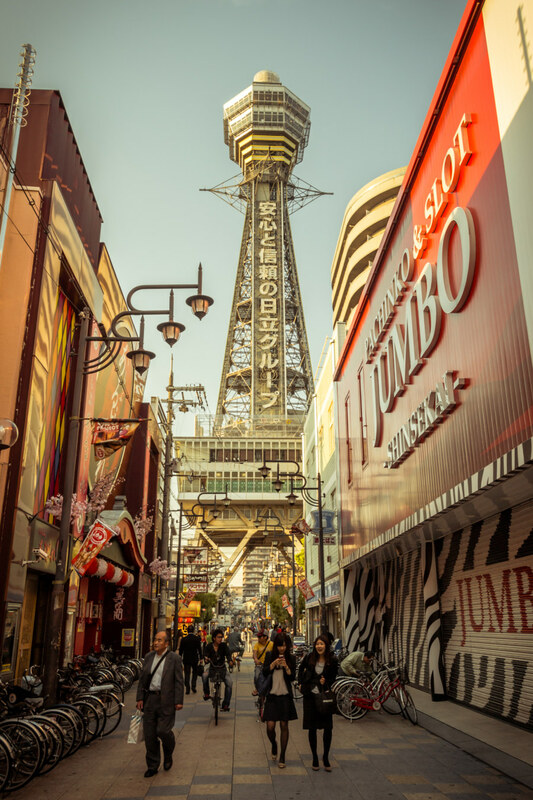 Shinsekai in the golden light. 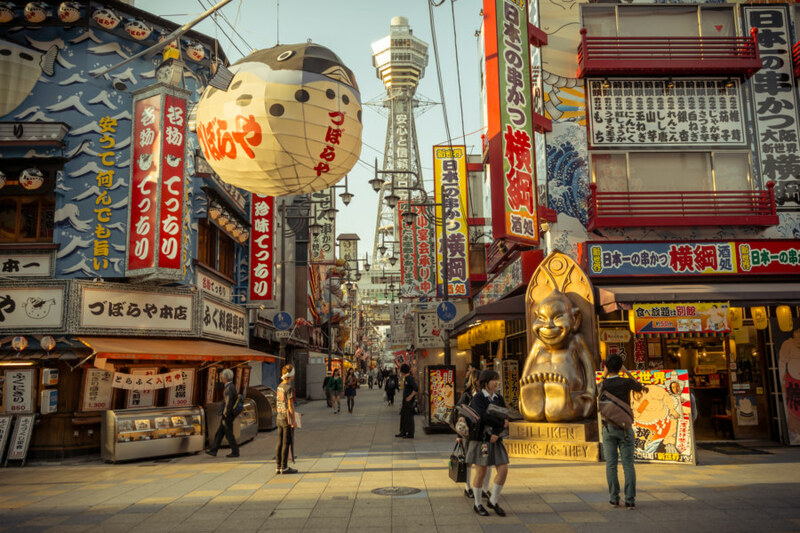 One of the more mysterious features of the urban landscape of Osaka is the Billiken, a cherubic statue emblazoned with the description “The God Of Things As They Ought To Be”. I knew nothing more than that at the time but have done some reading into the topic since then. Turns out these idols are American in origin and they came to the creator in a dream. Deposit a coin in the box and rub the feet of the Billiken and your wish may come true. 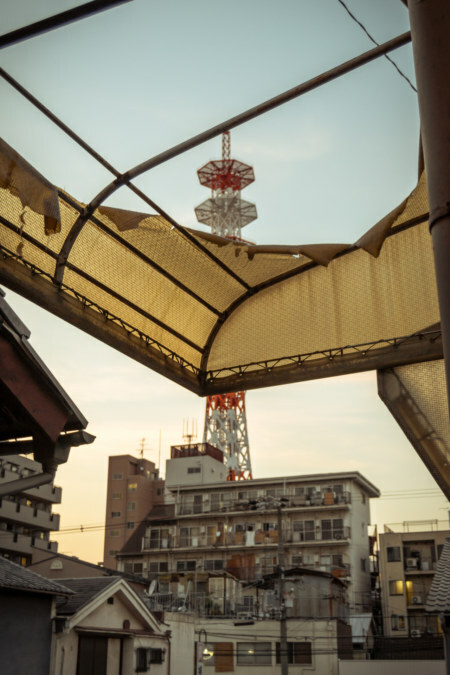 Tsutenkaku is the heart of Shinsekai. 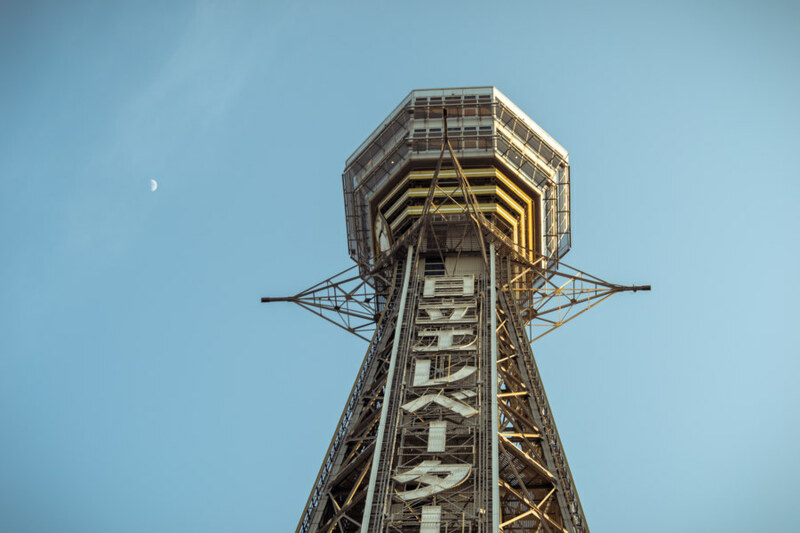 Tsūtenkaku 通天閣 is the name of the towering landmark at the heart of Shinsekai. 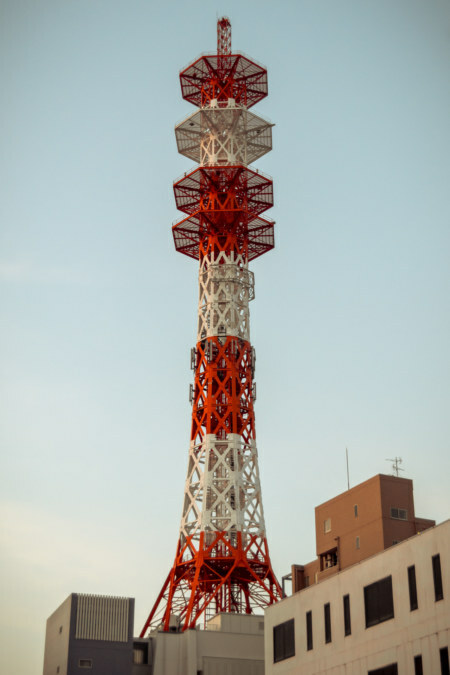 Built in 1956, this retrofuturistic throwback is the second tower to stand at this location. The first was dismantled for the war effort in 1943 after suffering a fire. It has the look of something from the dawn of the Space Age. 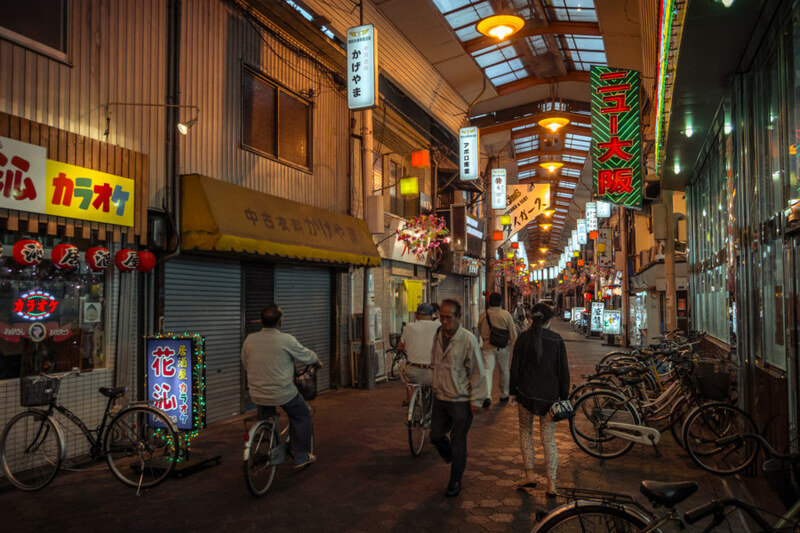 Having finished with Shinsekai I cut south into the seedy covered shopping streets of Nishinari ward. 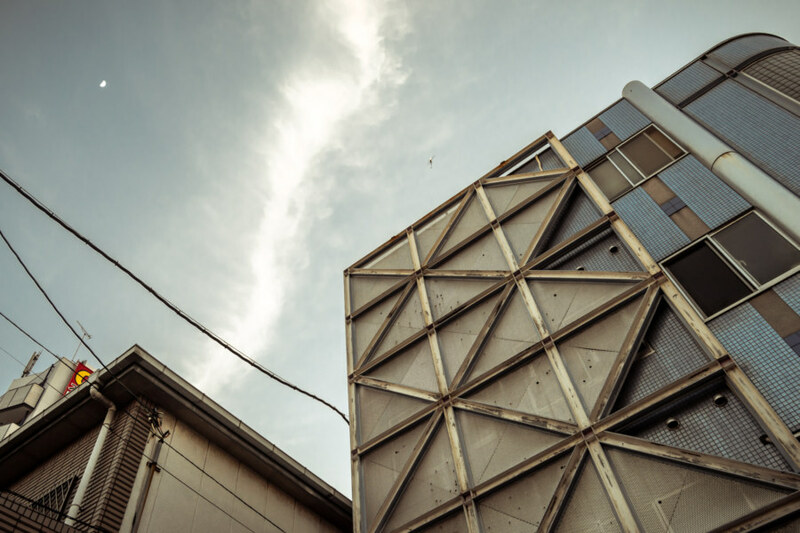 Having completed a brief tour of Shinsekai I circled back to the other side of the railway line and began my exploration of the streets to the south. I didn’t have far to go before chancing upon a bunch of old people sprawled out in front of a boarded-up storefront sorting cans and smoking cigarettes. 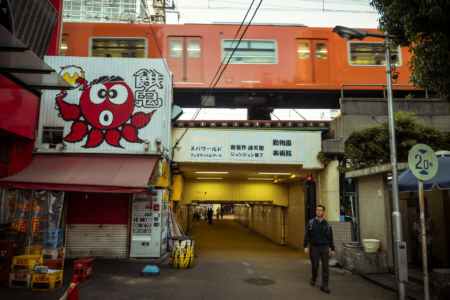 I made my way deeper into the sketch, passing 100 yen vending machines, crummy karaoke bars, and cheap grocery stores. 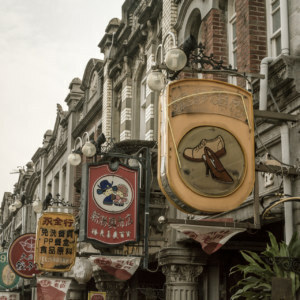 There were many street people around, almost all of them old men, barely sparing me a glance. I certainly looked out of place, bouncing around corners with my DSLR camera in hand, but I never felt like I was in any real danger. 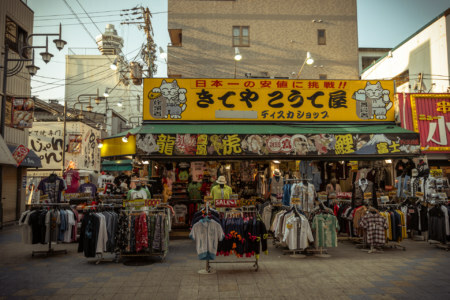 Street traffic in Nishinari. Things are starting to feel very weird by now. 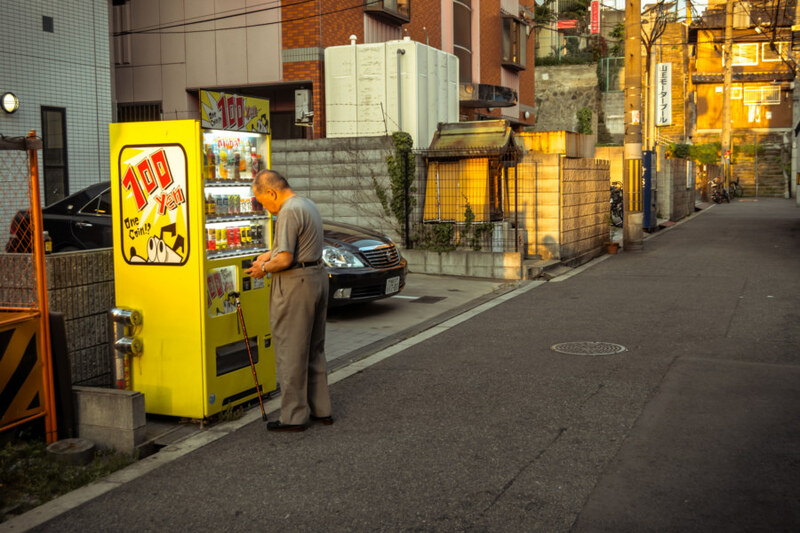 The infamous 100 yen vending machines common all over Nishinari ward. 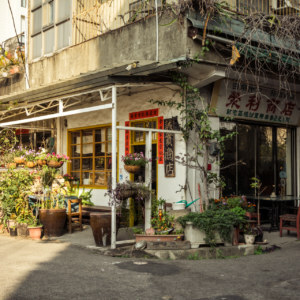 An old corner lot building in Nishinari. All boarded up in Nishinari. 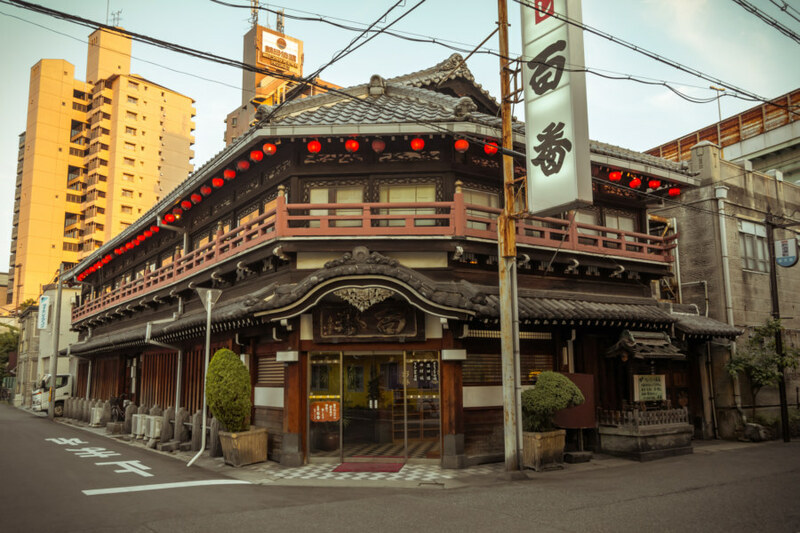 A famous restaurant in Tobita Shinchi. 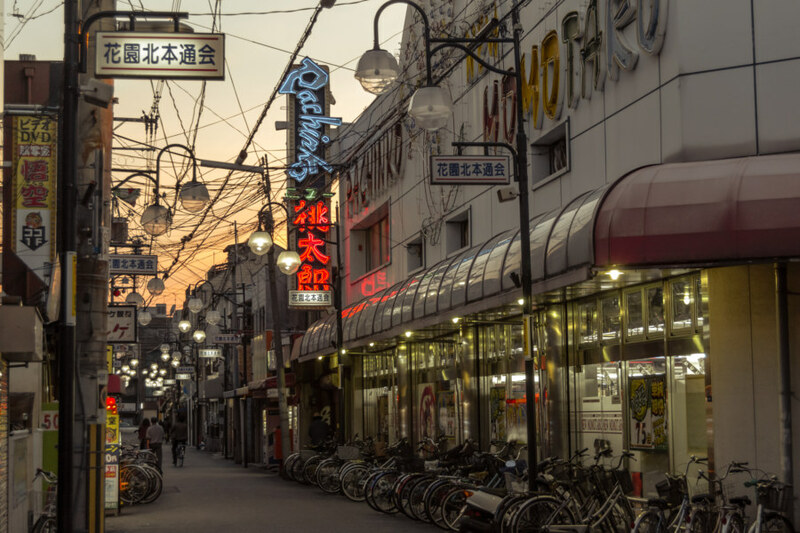 With a rosy orange glow consuming the western sky I arrived in Tobita Shinchi 飛田新地, a traditional district surrounded on all sides by the urban decay of Nishinari. I hadn’t any idea what I had stumbled upon at first. 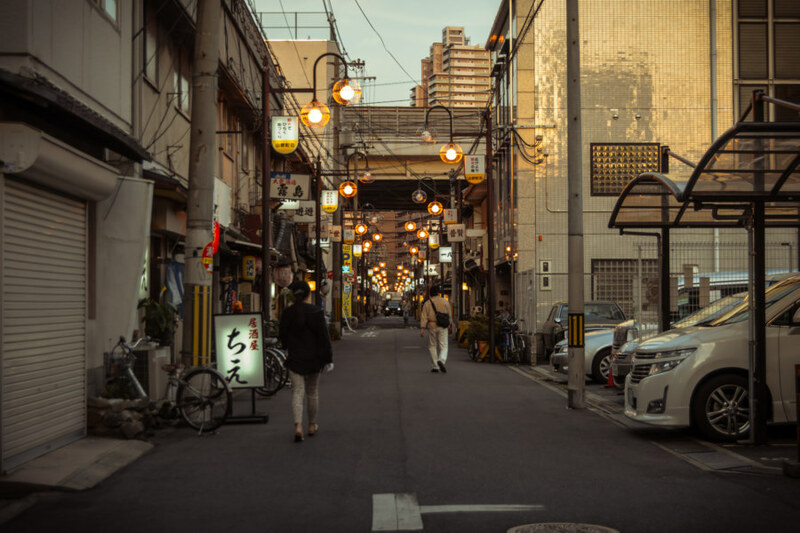 The buildings were all historic in appearance, much more so than anything else I saw during my brief time in Osaka, and the area was clean and well-kept, faintly illuminated by orb-like street lights and paper lanterns wrapped in plastic to protect them from the rain. 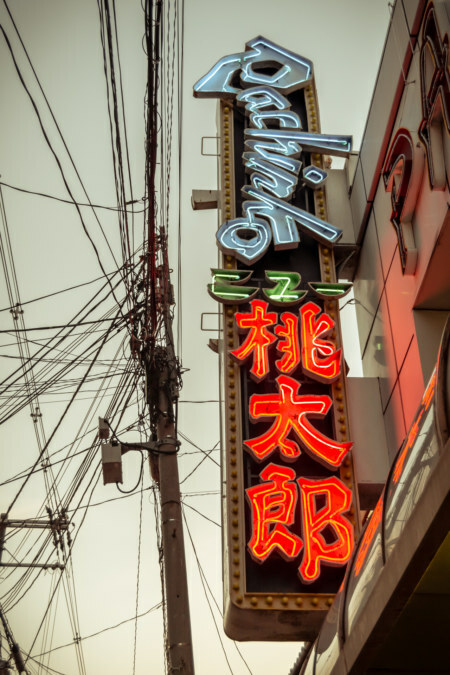 Each business was identified by a glowing white sign over the doorway, most of them in kanji. It felt like a place out of time, a throwback to the pre-modern era. Tobita Shinchi revealed its nature to me as soon as I wandered into view of the first doorway, or genkan 玄関. Here, old women perch on small chairs, sizing up potential customers with strategically placed mirrors. Many made inviting gestures, others turned aside and ignored me as I sauntered on, a loose grip on my camera to indicate understanding of the unspoken rules of the district. 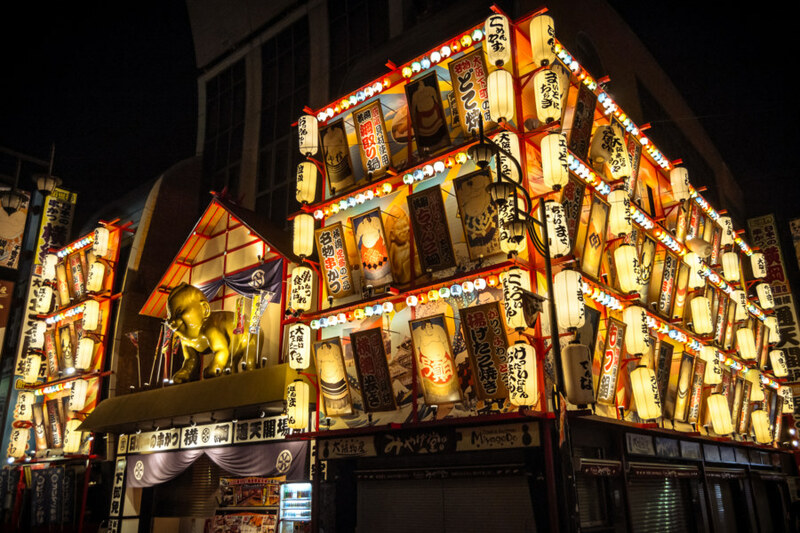 Beyond the threshold, inside every open doorway, incredibly bright lights shone down on a raised dais surrounded by ornate floral arrangements, decorations, and maneki-neko 招き猫 (literally “beckoning cat”, a lucky talisman seen in East Asian businesses all around the world). The centerpiece of these lavish displays: a woman kneeling in supplication, fancifully dressed to suit all kinds of fantasies, dazzling eyes and a wide beaming smile hoping to close the sale. And it just goes on and on like this, street after street. 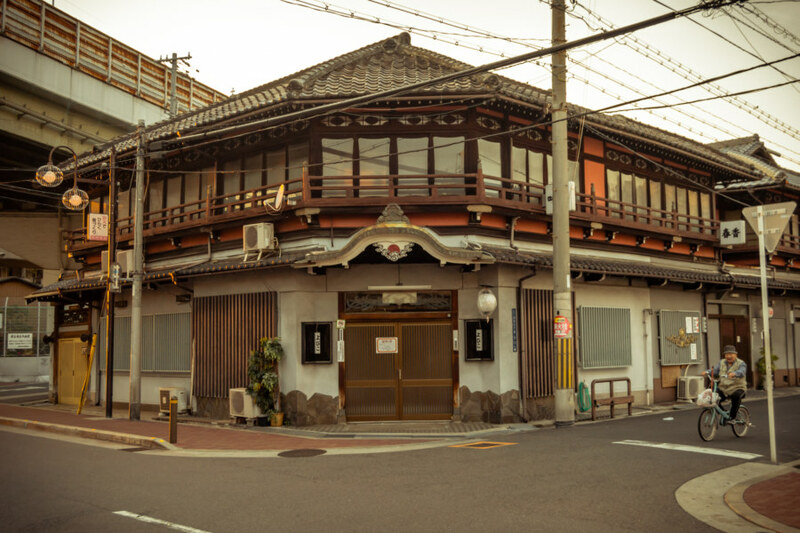 A historic building in Tobita Shinchi. I didn’t do anything more than window shop, not having the time, the money, the need, nor the inclination to find out what goes on upstairs. Even so, I have to admit that this part of my tour of Nishinari was as fascinating as it was unexpected. 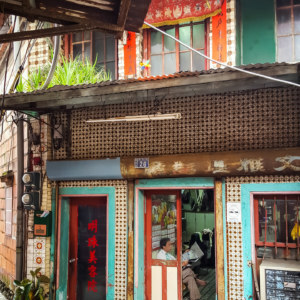 I have wandered around several of the infamous red light districts of Bangkok and Amsterdam, most of which were more melancholic than they were titillating, but Tobita Shinchi, by opening a window into a forgotten past, was almost bewitching in a way. 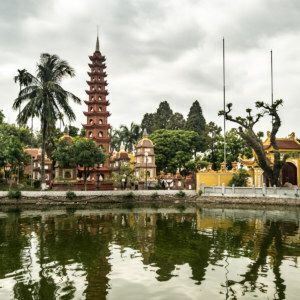 I don’t mean to glorify it, for there are no doubt some ethical issues to consider, but walking through the area was an interesting cultural experience I wouldn’t hesitate to recommend to adventurous travelers. Be respectful if you do pass through—and not only because the whole operation is reputedly run by yakuza. 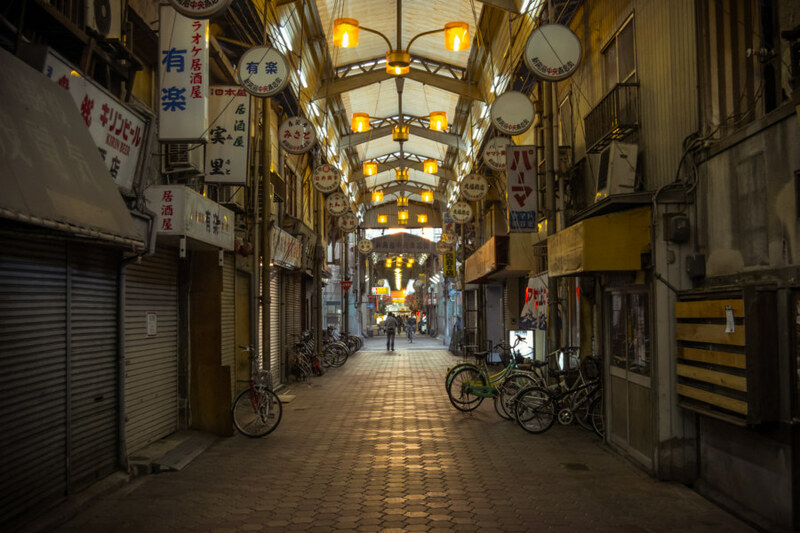 Deeper into the covered streets of Nishinari. 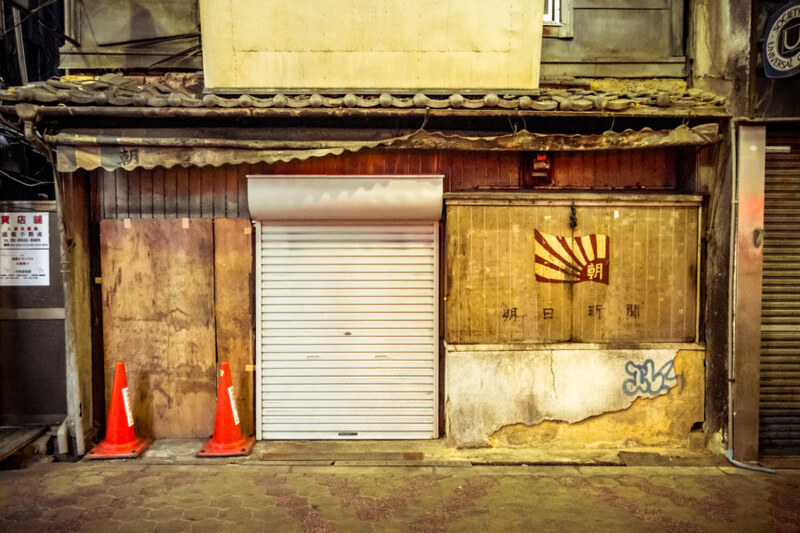 I wandered deeper into Nishinari, following the many shōtengai 商店街 (covered shopping streets) more or less at random, most of them lined with metal shutters that might not have been opened in years. 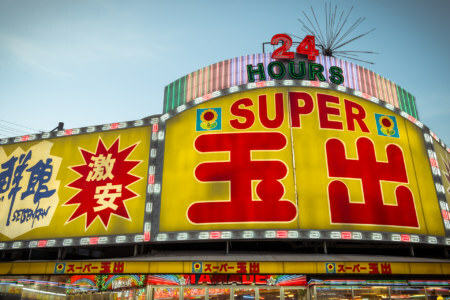 Maybe one in ten shops were open, most of them dingy karaoke bars or dollar stores, although several of the cut-rate grocers and pachinko parlours appeared to be doing a brisk trade. Deeper into the dark heart of Nishinari. 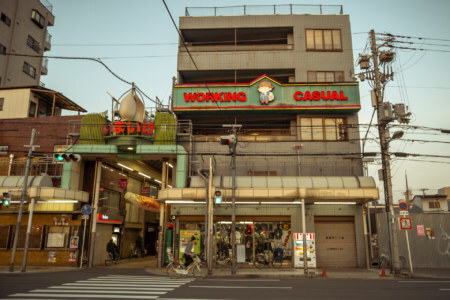 Working class shops in Nishinari ward. 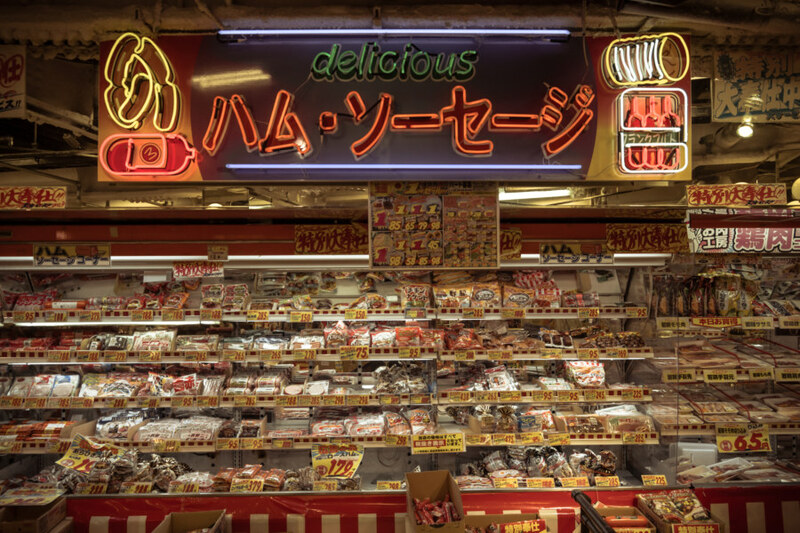 One of many cheap supermarkets in Nishinari. 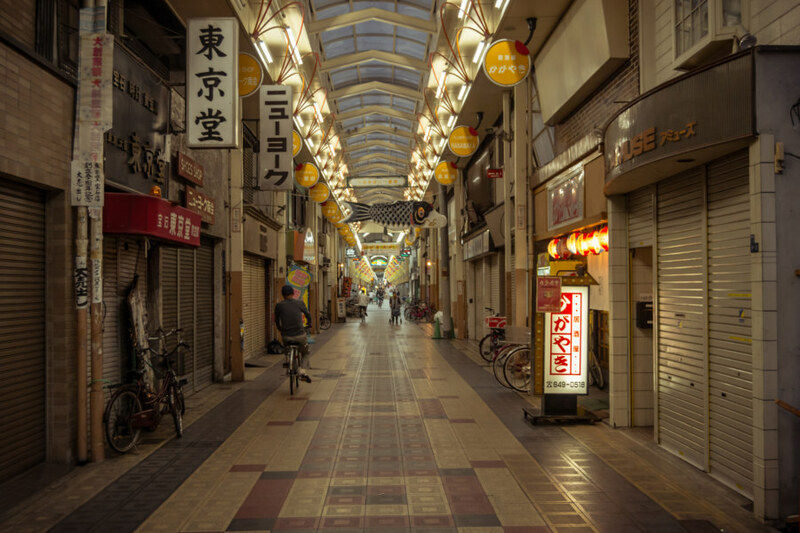 After dark in one of Nishinari’s many covered shopping streets. 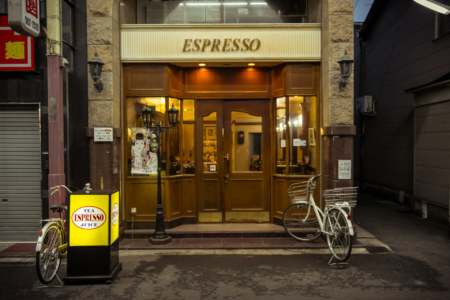 An anachronistic espresso bar in Nishinari ward. Not much remains apart from cheap grocery stores and seedy little bars. Daylight fading and another night begins. 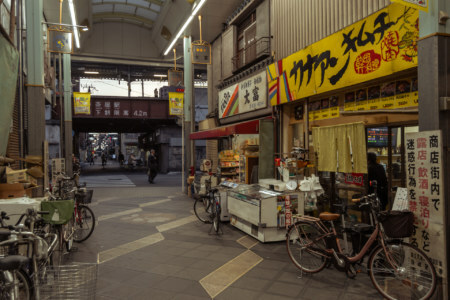 Yet another cheap supermarket in one of Nishinari’s covered shopping streets. Day turned to night and my feet began to swell from the amount of walking I had done these few days in Japan 日本. Without suitable lighting for even grainy, low-quality photos, I made my way back to my hotel. I hadn’t a map nor cellular access so I navigated by instinct, thankfully without mishap. On the uneventful walk back I pondered Nishinari’s notorious reputation. Was it really all that dangerous or merely poor? Had I been lucky? Most of the time I felt like a ghost passing through the ward, capturing moments without interacting with anyone hardly at all. No understanding seemed to pass between me and another mortal soul. I can’t even recall making eye contact with anyone apart from the old women of Tobita Shinchi. Later on I took a brief trip to Dotonbori for a more conventional tourist experience. 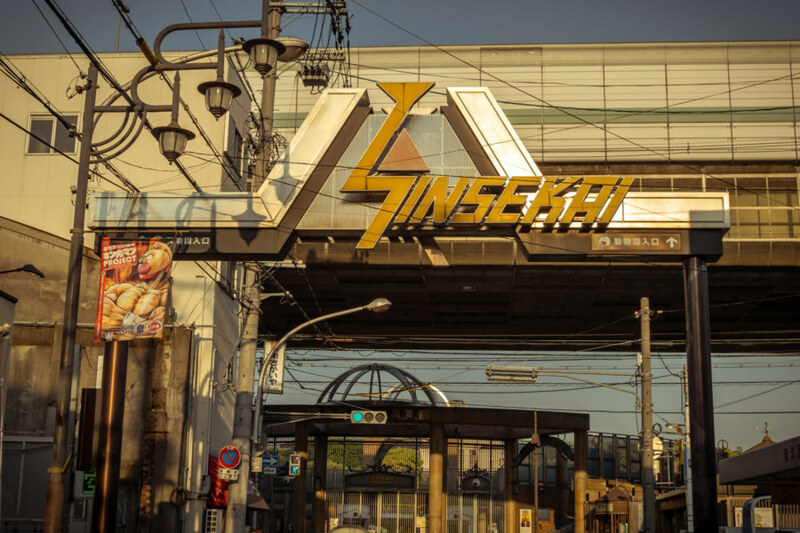 I passed through Shinsekai once more, curious to see if it had come alive at night, but it wasn’t any busier than when I was there in the late afternoon. I wondered, is this what people wish of the Billiken? Is this how it ought to be? Wow this post was real interesting as I am too afraid to explore by myself since I am a girl. But shinsekai sure does look a lot more lively now. 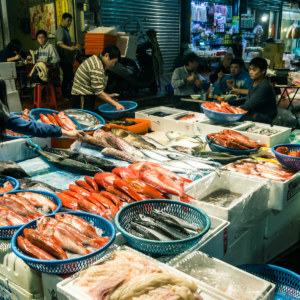 There’s many locals as well as foreigners throughout the day until dinner. I’ve been living in Nishinari for almost 8 months now, and I have to say that it’s more poor than dangerous. People may seem weird (old people, handicapped, drunk), but they are not dangerous. I have never felt unsafe here, and I have been walking here by day or night (really late) without any trouble (I’m a woman). Your post is really interesting with great photos. I travelled to Japan on my own (I’m a lady) in late May 2017 and stayed at a backpacker hostel in Nishinari. 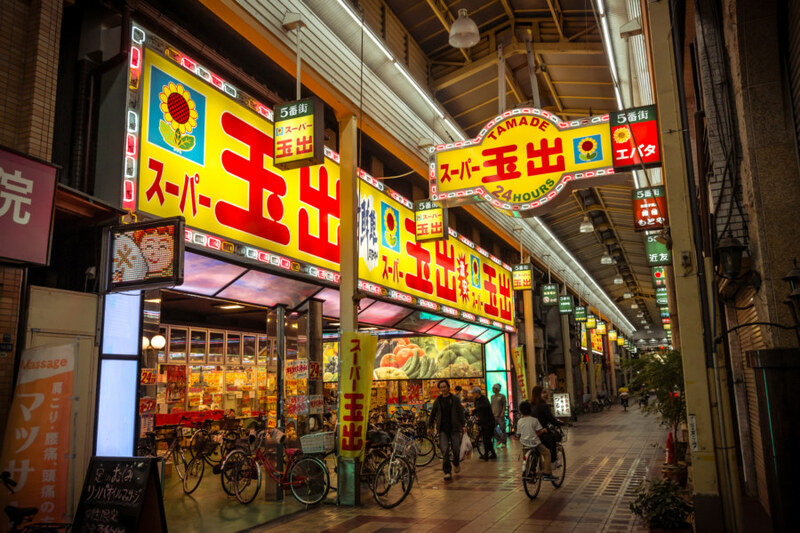 I’m so grateful that I got to explore the covered shopping streets, Tobita Shinchi and Shinsekai at night. 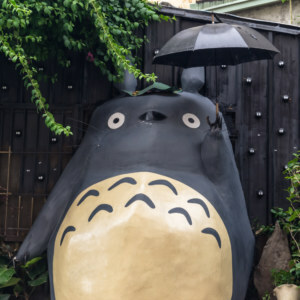 It shows me the other side of Japan apart from how great it is. I would not say the area is dangerous, but few men approached me when I was exploring the place so taking caution is a must for a lady travelling by herself. Nice post! I went to Tobita Shinchi about two years ago to experience the historical atmosphere which it most certainly has (and to window shop lol). As you say, I also found the place very bewitching and otherworldly. I went there in the late evening, probably after 9 PM, to see in the busiest time, with most houses open. 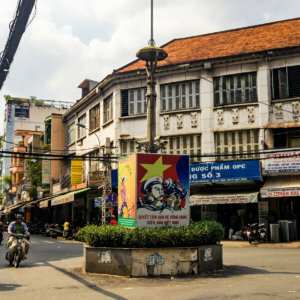 There was hardly anyone in the nearby streets, but as I entered the district it all changed as there were lots of people across many age groups, mostly in groups of at least two guys, walking around as if walking down a shopping mall and checking out the shop displays. 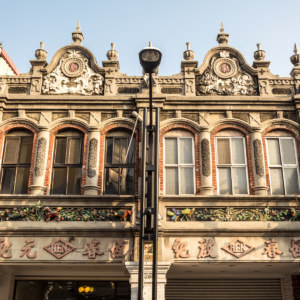 I went through all of the streets there and I have to say that in the northernmost two streets, which are apparently called Youth Street (青春通り) and Main Street (中央通り), it’s quite much a pretty girl next to another. It was a truly unique experience for me, as I have never been to a red light district like this one or the one in Amsterdam. But from what I’ve seen in some pictures from Amsterdam and Germany, I have to say that Tobita seems much more refined. The girls in Tobita are also always clothed; the least clothed wear at least underwear. Just a warning for potential visitors of Tobita Shinchi. No cameras (pretty obvious imho, you’ll see many ‘no photo’ signs there), especially if you go there when it gets busy, and women should refrain from going there. Women are not welcome there as it’s considered rude, as if coming to ridicule and look down on the girls working there. I’ve read somewhere that the old women trying to get customers in throw salt at women who happened to come there. your photo is great. 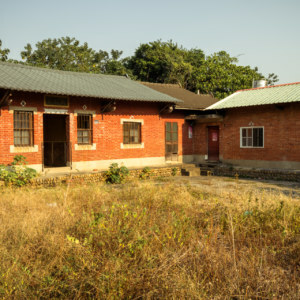 i’ve been there 2 – 4 december this year for traveling and stayed at one of hostel in Nishinari Ward. I met very kind and nice people who help me to found the hostel. and i am a woman, backpacking with my friend, also a woman, two of us stayed at nishinari for the first time. I stopped by cause I like your “about” and these gloomy flicks. Everything is, definetely, relative. It’s bearly a slum, it’s an eastern Monaco !! 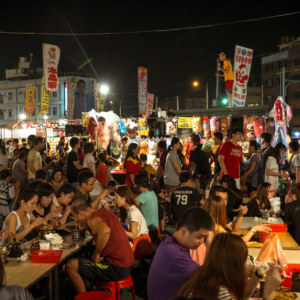 Would u be in Taiwan the next trimester ?